To restore peace in the Borders between Scotland and England, two kings have betrothed Lady Hilaire Eliot to a cursed, thrice-widowed knight known as The Dire Dragan. Headstrong Hilaire will do anything to escape that fate, even confront her fear of the dark by fleeing her besieged castle through an ancient tunnel. 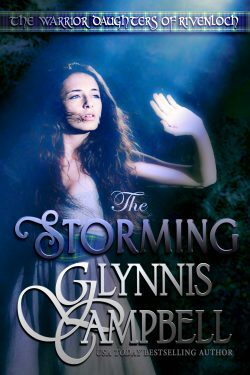 Her bridegroom, Giric mac Leod, is just as determined to claim his rightful bride. But when he storms her fortress, his reckless actions trap him in an underground rockslide. The dispirited knight is ready to surrender to death’s embrace…until he hears the one sound he can’t ignore—the call of a maiden in distress.